Feel better today; stay healthy for tomorrow. Make smart choices from every food group. Get the most nutrition out of your calories. You may be eating plenty of food, but not eating the right foods that give your body the nutrients you need to be healthy. You may not be getting enough physical activity to stay fit and burn those extra calories. Start finding your way to a healthier you today. The sooner you start, the better for you, your family, and your future. Once you learn about the value of nutrition, sign up to take the Challenge and start a new path to a healthier, happier you. You will also earn an opportunity to win $100 cash or a 3-day vacation stay at The Island on Lake Travis. Are you ready to take the Path to Health Challenge? At the store, plan ahead by buying a variety of nutrient-rich foods for meals and snacks throughout the week. When grabbing lunch, have a sandwich on whole- grain bread and choose low-fat or fat-free milk, water, or other drinks without added sugars. In a restaurant, opt for steamed, grilled, or broiled dishes instead of those that are fried or sautéed. On a long commute or shopping trip, pack some fresh fruit, cut-up vegetables, string cheese sticks, or a handful of unsalted nuts—to help you avoid impulsive, less healthful snack choices. Focus on fruits. Eat a variety of fruits—whether fresh, frozen, canned, or dried—rather than fruit juice for most of your fruit choices. For a 2,000-calorie diet, you will need 2 cups of fruit each day (for example, 1 small banana, 1 large orange, and 1/4 cup of dried apricots or peaches). Vary your veggies. Eat more dark green veggies, such as broccoli, kale, and other dark leafy greens; orange veggies, such as carrots, sweet potatoes, pumpkin, and winter squash; and beans and peas, such as pinto beans, kidney beans, black beans, garbanzo beans, split peas, and lentils. Get your calcium-rich foods. Get 3 cups of low-fat or fat-free milk—or an equivalent amount of low-fat yogurt and/or low-fat cheese (1½ ounces of cheese equals 1 cup of milk)—every day. For kids aged 2 to 8, it’s 2 cups of milk. If you don’t or can’t consume milk, choose lactose-free milk products and/or calcium-fortified foods and beverages. Make half your grains whole. Eat at least 3 ounces of whole-grain cereals, breads, crackers, rice, or pasta every day. One ounce is about 1 slice of bread, 1 cup of breakfast cereal, or ½ cup of cooked rice or pasta. Look to see that grains such as wheat, rice, oats, or corn are referred to as “whole” in the list of ingredients. Go lean with protein. Choose lean meats and poultry. Bake it, broil it, or grill it. And vary your protein choices—with more fish, beans, peas, nuts, and seeds. Also use power soy or whey protein to make power drinks such as shakes, juices and power breakfasts by adding it to your oatmeal, pancakes, cereal, etc. For a complete list of healthy recipe booklets on our website, click here. Know the limits on fats, salt, and sugars. Read the Nutrition Facts label on foods. Look for foods low in saturated fats and trans fats. Choose and prepare foods and beverages with little salt (sodium) and/or added sugars (caloric sweeteners). Becoming a healthier you isn’t just about eating healthy—it’s also about physical activity. Regular physical activity is important for your overall health and fitness. It also helps you control body weight by balancing the calories you take in as food with the calories you expend each day. Be physically active for at least 30 minutes most days of the week. Begin with a 12 minute exercise, walk, dance routine and increase it to 30 minutes. Increasing the intensity or the amount of time that you are physically active can have even greater health benefits and may be needed to control body weight. About 60 minutes a day may be needed to prevent weight gain. The 60 minutes may be divided into two 30-minute sessions. Children and teenagers should be physically active for 60 minutes every day, or most every day. Click here to register for a FREE ZUMBA CLASSES sponsored by Primero Health, Inc…. …or click on one of the video links below to begin a workout in your own home! If you eat 100 more food calories a day than you burn, you’ll gain about 1 pound in a month. That’s about 10 pounds in a year. The bottom line is that to lose weight, it’s important to reduce calories and increase physical activity. There is a right number of calories for you to eat each day. This number depends on your age, activity level, and whether you’re trying to gain, maintain, or lose weight. * You could use up the entire amount on a few high-calorie items, but chances are you won’t get the full range of vitamins and nutrients your body needs to be healthy. Choose the most nutritionally rich foods you can from each food group each day—those packed with vitamins, minerals, fiber, and other nutrients but lower in calories. Pick foods like fruits, vegetables, whole grains, and fat-free or low-fat milk and milk products more often. Keep these low: saturated fats, trans fats, cholesterol, and sodium. Get enough of these: potassium, fiber, vitamins A and C, calcium, and iron. Use the % Daily Value (DV) column when possible: 5% DV or less is low, 20% DV or more is high. Make your calories count. 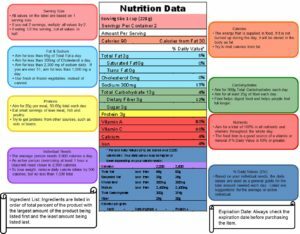 Look at the calories on the label and compare them with what nutrients you are also getting to decide whether the food is worth eating. When one serving of a single food item has over 400 calories per serving, it is high in calories. Don’t sugarcoat it. Since sugars contribute calories with few, if any, nutrients, look for foods and beverages low in added sugars. Read the ingredient list and make sure that added sugars are not one of the first few ingredients. Some names for added sugars (caloric sweeteners) include sucrose, glucose, high fructose corn syrup, corn syrup, maple syrup, and fructose. Reduce sodium (salt) and increase potassium. Research shows that eating less than 2,300 milligrams of sodium (about 1 tsp of salt) per day may reduce the risk of high blood pressure. Most of the sodium people eat comes from processed foods, not from the saltshaker. Also look for foods high in potassium, which counteracts some of sodium’s effects on blood pressure. Know your fats. Look for foods low in saturated fats, trans fats, and cholesterol to help reduce the risk of heart disease (5% DV or less is low, 20% DV or more is high). Most of the fats you eat should be polyunsaturated and monounsaturated fats. Keep total fat intake between 20% to 35% of calories. Know Your Protein. Protein comes primarily from animal sources, such as beef, chicken, or fish, and dairy. Soy is also a source of protein as well as nuts and seeds. Protein is the major source of building material for muscles, blood, skin, hair, nails, and internal organs, including the heart and the brain. A portion of beef, chicken or fish is generally about the size of and thickness of the palm of your hand. For packaged food, be sure to look at the nutrition label for serving sizes to help you eat the correct portion. Know the Facts about Carbohydrates (Carbs). A carbohydrate (carb) is anything that once grew in the ground or is refined from something that once grew in the ground, such as fruits, vegetables, sugar, breads, pastas and alcoholic beverages. Every time we eat carbs, our system converts it into sugar (glucose), which is use for energy or, more often, it is stored as fat! The process of stored fat causes weight gain, which leads to chronic diseases, such as diabetes, cardiovascular, etc. Patients of chronic diseases suffer horrific complications, such as loss of eye sight, body parts, experience a miserable quality of life, and eventually, premature death. It is critical to learn to eat carbs for energy vs for stored fat; our lives depend on it. First, know that there are two different types of carbs: Fast and Slow Cabs. Fast Carbs, such as potatoes, bread, sweets, and alcohol convert to sugar quickly and switches your body into a “fat storing mode”, while Slow Carbs with high fiber, such as greens, beans, berries, coverts into sugar much more slowly. This sugar is what gives you the energy to exercise, work longer hours, think more intense and be creative and productive. 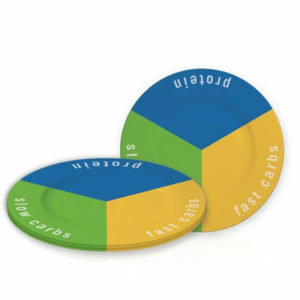 For more information about and examples of Fast and Slow Carbs, and Glycemic Index, click here. Third, choose your Slow Carb. Version A: includes one portion of Protein, Fast Carb and Slow Carb. Example: Steak, Baked Potato and Veggies OR Turkey with gravy, Asparagus, and one glass of Wine (wine substitutes a fast carb). Note that carbs can be substituted as long as it is replaced with a carb of same value. You may also substitute one Fast Carb for two or three Slow Carbs. For more information about and examples of Fast and Slow Carbs, and Glycemic Index, click here. Version B: includes one portion of Protein and three portions of Slow Carbs. Example: Large grill chicken salad OR a Stir Fry Dish. Version C: includes one portion of Protein and one Fast Carb (no Slow Carb). Example: One Protein Shake OR scrambled eggs and toast. This version is often used when on the run and at breakfast. Some meals combine all three components (Protein, Fast and Slow Carbs) into one dish and are known as “solos”. These dishes can be an easy way to ensure that you get a well-balanced Power Meal. Examples of “solos” include: Sandwich, Lasagna, Beef Stew, etc. To accelerate weight loss, you may choose 1/3 portion of protein 2/3 portions of Slow carbs OR you may substitute a meal for a nutritious drink consisting of one half Protein and one half Fast Carb, such as a protein drink. When you eat or drink something, your body does one of two things with it. Either it burns it for energy or stores it as body fat. The combinations you use to eat your food can have a huge effect on whether your body uses it for energy or stores it as fat. Once you learned to make and eat well-balanced power meals, you will have the secret to eat your favorite foods and still manage to be at your desired weight. These are the basic guidelines for eating a healthy diet and being physically active as per the Dietary Guidelines for Americans 6th Edition. Now that you know the value of nutrition, are you ready to take the Challenge?